Old Japanese Biidoro (vidro, Portuguese) kanzashi made out of glass. Glass making was introduced to the Japanese by the Portuguese in the16th century and there has been glass manufacturers in Japan ever since that date. It was particularly popular in Japan during the 19th century. The style of this kanzashi is called tama (ball) kanzashi. The ball is 3/4" (in diameter) natural coral. 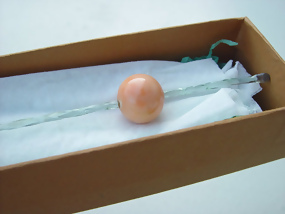 It is rare to find a glass Kanzashi in this condition. The kanzashi is 7 7/8" long. Meiji period (1868-1912).